If you’re trying to figure out what the economy is doing and where financial markets are headed in the near future you can focus your efforts on a never-ending flow of charts, earnings reports and scores of daily analyses from professionals around the world. “If you don’t have a ping-pong table, you’re not a tech company,” saysSunil Rajasekar, chief technology officer at Lithium Technologies, a San Francisco software startup. 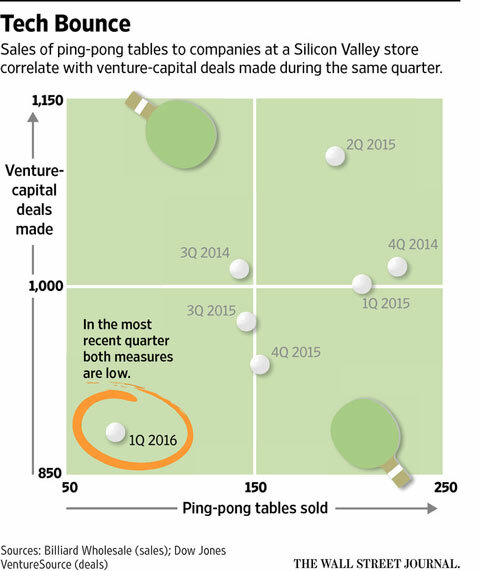 Table sellers seeing a decline include David Vannatta, sales team leader at Sports Authority in San Francisco. The store was getting a “good flow of tech companies” buying tables, he says, but sales have fallen since Christmas. “We’re much more concerned about the market going down 20% than we are it going up 20%. And so the significant weighting to the short side reflects that,”Cozza added. And he’s not the only one who’s keeping his eye on the ping pong ball. The former Duquesne hedge fund manager, who averaged annual returns of 30 percent from 1986 through 2010, also agreed that negative rates are “absurd," said that he is bearish stocks, and concluded by revealing what his biggest currency allocation is. “Some regard it as a metal, we regard it as a currency and it remains our largest currency allocation” he said, without naming the metal. The smart money investors aren’t the only ones preparing. The elite around the world are downright terrified, as highlighted by their feverish pace to build emergency bunkers in an effort to insulate themselves from the revolution, rebellion and anarchythat would follow a widespread economic collapse. You’d think they might be crazy for going to such extremes, but they aren’t alone. The US government has been simulating economic collapse and civil unrest scenarios since just after the Crash of 2008, which suggests they, too, are expecting nothing short of a national apocalypse when this thing blows. As for the rest of us, if you haven’t already taken steps to prepare for the disaster to follow, now is the time. Major global investors are re-allocating their financial positions, the elite are already getting out of Dodge, and the U.S. government itself is stockpiling emergency supplies and, quite literally, billions of rounds of ammunition. But don’t worry because President Obama saved the world from depression, so these people must be overreacting to all of that peddled fiction about the world being in crisis.